One pedal driving is available in many battery electric vehicles and plug-in hybrids, allowing drivers the option to brake to a complete stop without actually pressing on the brake pedal. The car’s electric motors can use the regenerative braking power to great effect. Leave it to Engineering Explained to explain how this functionality works to make your EV commute a little easier. Basically, while using that EV motor braking, you’re turning the car’s forward kinetic energy motion into electricity to charge the battery. Rather than expend braking energy as heat in the brake rotor, an electric car can make better use of braking forces to increase efficiency. Obviously you can never recover as much energy as you expend getting up to speed in the first place, but using this technique can extend your range by an appreciable distance. 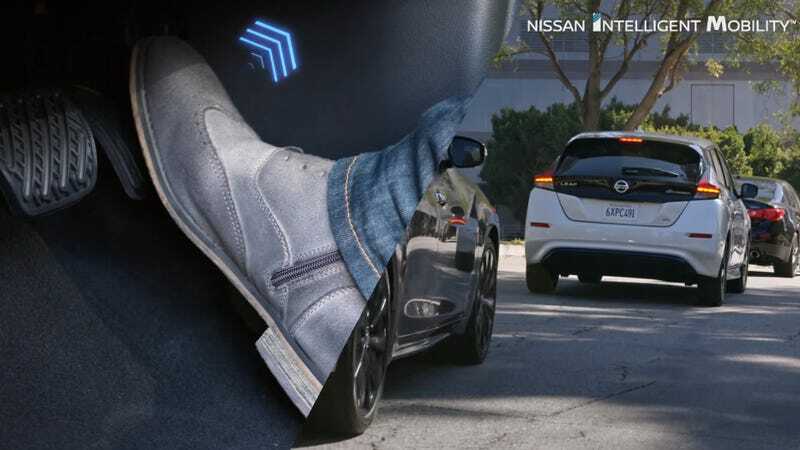 The car Jason uses in his video is a current Nissan Leaf, which was the first car to offer a fully one-pedal driving system. Chevy’s Bolt and Tesla have similar systems now, as well. According to a Tesla engineer questioned about the regenerative system on the original Tesla Roadster, that system was 65% efficient at energy recapture. As systems have evolved over the decade since, one would hope for slight gains in that number. Here is Nissan’s explanation of how their system works with slick graphics and split-screen visuals. At $8,000, Would You Be Shocked By This 2001 BMW 330ci Electric Conversion?